another day another vice another roll of the dice: How to create multibootable CD with ImgBurn? 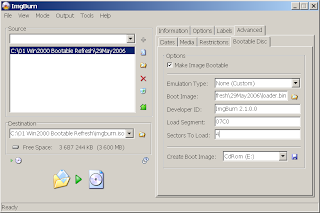 How to create multibootable CD with ImgBurn? 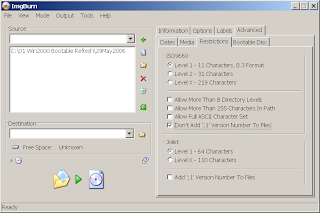 ImgBurn is a great windows CD/DVD writing program. It's tiny compared to Nero (Imgburn v2.1.0.0 size is about 1Mb in install). 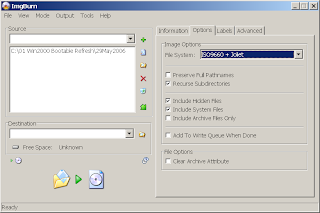 To create multibootable image you will need some tools from Bart Lagerweij http://www.nu2.nu/diskemu/ Namely diskem1x.zip archive. Then you need some bootable disk images - usually these are images of 1.44Mb floppy disks. Pay attention to diskemu.cmd - it is an exemplary configuration file. It will probably work for you, but will not load anything, because it is not configured for your images. This file contains description of actions that should be taken when you press keys. Actions are actually commands to run images. Just take a look at it and you'll get an idea. Place you images in the folder structure of your ISO, so that diskem1x.bin (the loader) could find them and edit diskem1x.cmd accordingly. You will probably have to repeat this instructions several times to debug your menus, but the final toast will worth it. Enjoy!